Betties N Brimstone: What Time Is It? So I'm a little surprised I haven't done a proper blog post about this sooner. Especially since I've dressed up as an Adventure Time character for the last two Halloweens (proof here and here). 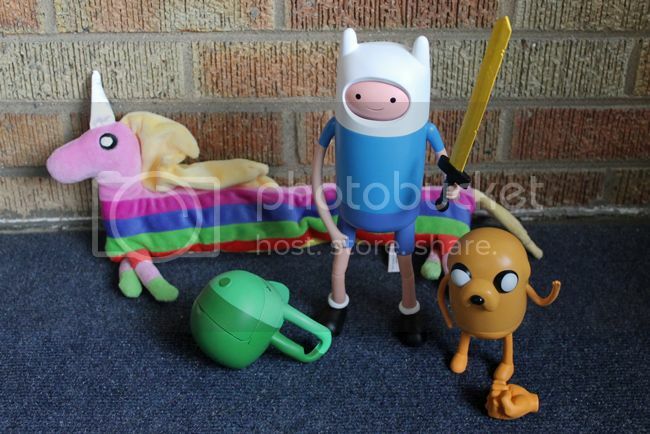 I figured it was about time for a post featuring our Adventure Time toy collection. These toys have only been out for a relatively short amount of time, and only in the last few weeks does it seem like they've been becoming easier to find at your local Toys R Us stores. 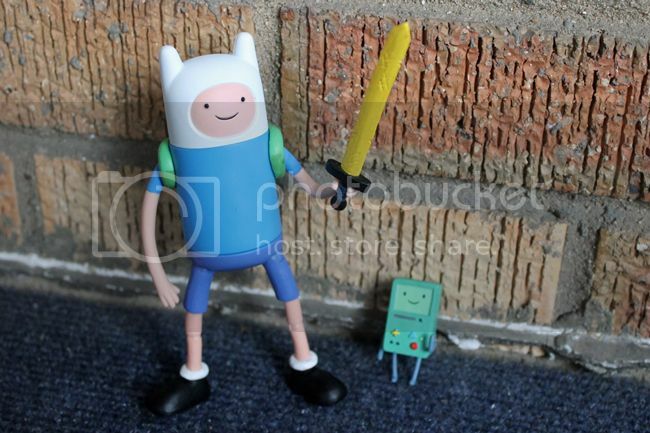 The first figure Todd ever bought was the tall Finn (pictured above) with removable backpack, sword, and changing face (see down below a few for deets and pictures). My latest acquisition is the super awesome Lady Rainicorn plush beanie baby thingy (see above). 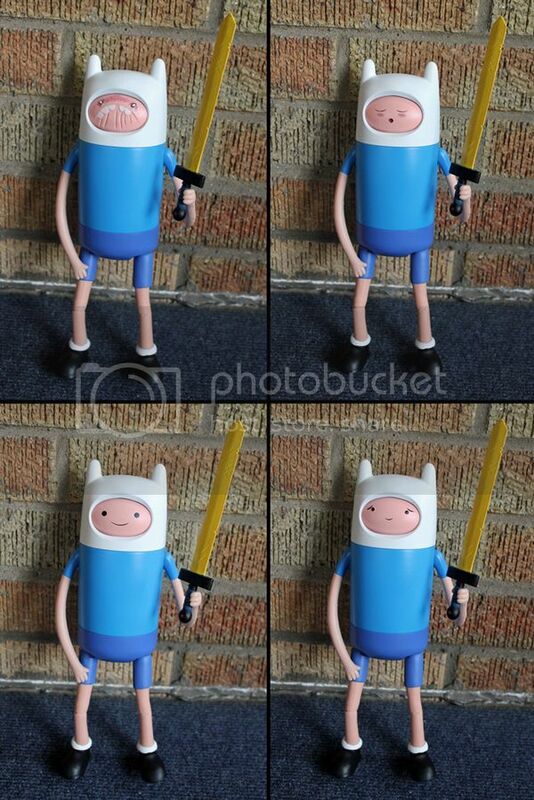 Above is the smaller "stretchy" Finn that's available (stretchy Jake is pictured in the top image with removable fist), but the stretchy part really just refers to the arms. It's more like "bendy." Also, the skinny limbs make the figures pretty fragile, so I wouldn't give them to little kids. Below is the taller 12" Jake with changing faces. The face section "rolls" back into the head to change the expression. See all four below. It's pretty cute. We didn't even know that a bigger version of Beemo existed until I spotted him at the store. Beemo also has changing faces, just like the Finn figure. See all of Beemo's facial/screen options below. 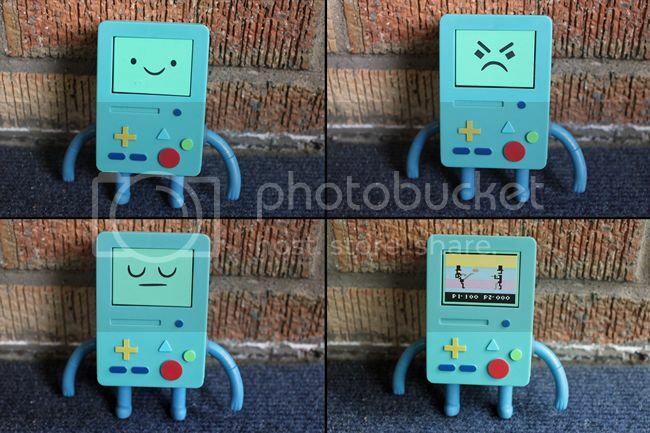 For those of you unfamiliar with the show, Beemo is a video game device. I think he looks like a Game Boy, but he's more like an entire console with built-in TV when you see him on the show. He, of course, is a character unto himself that can walk and talk... like most of the things in this cartoon...! You can visit here for a more complete description of the Adventure Time characters. Below is a picture of an Adventure Time doll that I made almost two years ago. It was before any Adventure Time toys even existed. 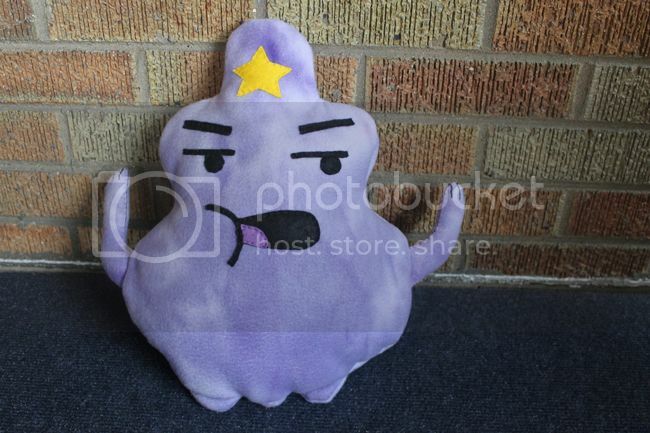 My brother decided that he wanted to make a Lumpy Space Princess plush doll, so I told him that I would help in exchange for me making my own at the same time. So we had our own little "crafternoon" and made LSP dolls. I'm still pretty proud of her, so it seemed appropriate to include her in this post. How about you - what's your favorite cartoon? This is totally one of my favorite ones! My 6 year old is tripping out over Beemo and LSP! hahahahaa I also love Gumball too and have you seen the new My Little Pony? Pinkie Pie is on crack I swear! And I love it!!!! Dafty Duck is my favorite narcissistic cartoon character.